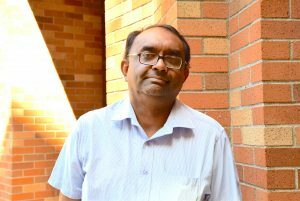 Sumit Roy, professor of electrical engineering, is a wireless communications/networking expert who has been a long-term contributor to the ns-3 project. The paper, entitled “Link-to-System Mapping for ns-3 Wi-Fi OFDM Error Models,” was awarded the top paper prize at the annual WNS3 Workshop. The paper investigates Wi-Fi OFDM (Orthogonal Frequency Division Multiplexing) performance over AWGN (additive white Gaussian noise) and fading channels, developing an ns-3 ErrorRateModel based on tables compiled from link simulation results. This research allows others to reproduce and extend the basic tables for future implementation. This is a reflection of quiet, but consistent work at the University of Washington Department of Electrical Engineering (UW EE) on ns-3, including core simulator architecture as well as new and refined user modules. Authors on the paper include lead author Rohan Patidar, UW EE Professor Sumit Roy, UW EE Affiliate Professor Thomas Henderson and Amrutha Chandramohan.